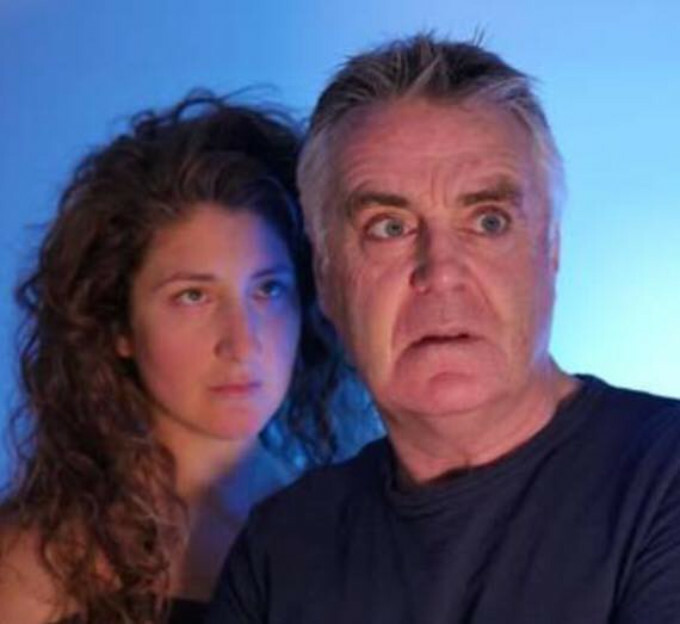 Having now returned from holiday, I am delighted to confirm that Mengele was shortlisted for the SitUp Awards at this year’s Edinburgh Fringe. Tim, Emma and Stefanie performed to full houses every day and received many accolades and heartwarming reviews from press and audiences alike. The play will be touring again in late 2018 and 2019 and thanks to the wonderful support we received from the Holocaust Education Trust, who raised over £750.00 via their collections outside The Box venue and throughout the festival for their wonderful work in schools etc, awareness continues to increase. Katzpace, the purpose built theatre within the Katzenjammers bierkeller, proved to be the right venue for 4 nights prior to the play making its move down under as a part of guy Masterson’s tour of Australia. 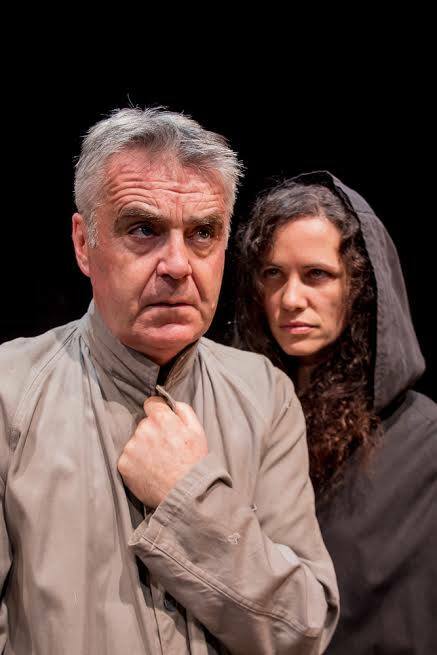 We were delighted with the reviews and our new actress, Emma Wingrove proved to be a formidable opponent for Tim Marriott’s now legendary portrayal of the Angel of Death, Dr Joseph Mengele. The curtains have now come down for the final time in Adelaide and we have been delighted with the response from audiences and critics alike. Playing to packed houses every night, Tim Marriott as Mengele and Stefanie Rossi as Azra’il have elicited rave reviews from the critics. 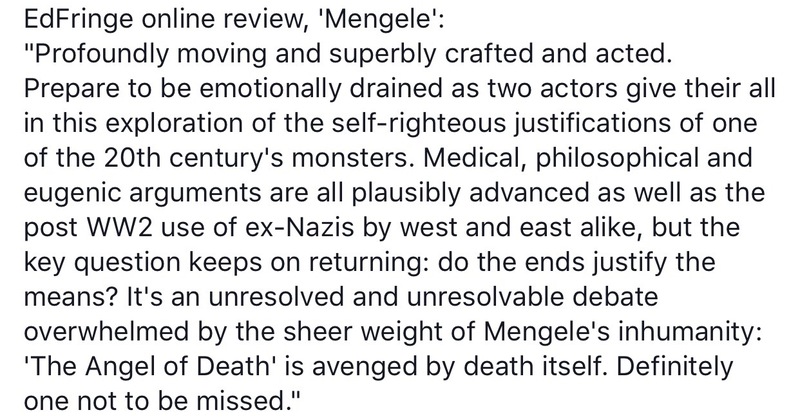 Here is our first review from the Grassmarket performance of Mengele. We are delighted to confirm this ten day run at the iconic, off-Broadway theatre which is The SoHo Playhouse. The play opens at the Printer’s Playhouse in Eastbourne. Follow the link below to watch a video trailer and for links to ticket sales. As we near the end of what has been a very exacting year for most and an even worse one for others, it gives me great pleasure and not a little satisfaction to confirm that my stage play, entitled “Mengele” will open in Eastbourne in the New Year, before moving to London. Co-written with one of my oldest and most trusted friends, Tim Marriott, it is a three act stage play, dark, sinister and challenging which will test both the imagination and the sensitivities of the theatre goer alike. For those of you who have read my novel, Right to Live, you will know about my research and sometimes exhausting quest to discover more about one of the most evil men to have walked this earth. His background is well documented and his life picked over with a fine toothcomb, but his last years are still a matter of conjecture. Much revision has taken place and there are those who believe that he died a very lonely man, yet others are still firmly convinced that his ’empire’ stretched way beyond the South American jungles and into the USA and Europe. There is no doubt that he was well-financed by his wealthy family back in Bavaria throughout his years in Argentina, Bolivia, Peru and Brazil and he never appeared to want for anything. Unrepentant to the end, according to his son Rolf, a lawyer, the ‘Angel of Death’ was a committed genocidal and nihilistic Nazi, who saw purity in his crackpot experiments, juxtaposing immense cruelty with random acts of kindness and acting with a dispassionate cruelty seemingly on a whim. I hope that many of you will get to see the play, whether in Eastbourne or London. We are planning to take it on tour to festivals and fringes across the country and in time, turn it into a TV play. I wish you all a peaceful Christmas.